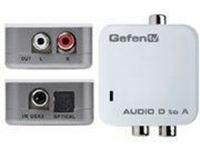 The Digital To Analog Audio converter box takes your coaxial/optical (S/PDIF or TOSLink) digital audio source and converts it to standard analog left/right audio, for connection to an amplifier via standard RCA-style jacks. Now you can bridge your legacy sound system with digital sources such as DVD and CD players that don't have RCA-style analog outputs. Run a short extension cable from an available digital audio output jack on your digital source device to the same type of digital input on the Converter. Select which kind of digital signal (coaxial or optical) is being input with the selector switch on the converter, then hook up your analog RCA-style left and right cables to the Converter's analog RCA jack outputs and power up all equipment. That's all there is to it!